The hackathon fever started again with the first of this season at The University of Texas at Arlington. 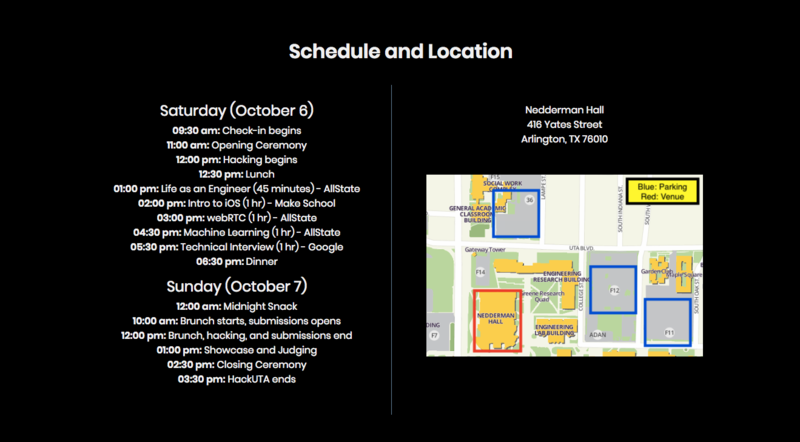 The University of Texas at Arlington’s annual 24-hour hackathon is an invention marathon for people with any experience, any background, any education and any text editor to come, hack, have fun, collaborate, build and win prizes. Hacking will take place in Nedderman Hall on the weekend of October 6th and 7th, 2018. How can I register for parking? Can I submit previous work? Best Use of Algolia - Featured API! HackUTA's vision is to give back to the community and help spread innovation and creativity though students. These big guys loved to make the hackathon even bigger by their support, sponsorship and their valuable time. The good hands lent their hands as the title sponsor of this spectacular event. Being one of the largest publicly held Insurance company in the United States, they generously sponsored to this event. As their motto, “You're In Good Hands With Allstate”, good hands are really good hands. You don’t need an introduction to this giant. Google is an American multinational technology company that specializes in Internet-related services and products, which include online advertising technologies, search engine, cloud computing, software, and hardware. Google's Women Techmakers program provides visibility, community, and resources for women in technology. Google is partnering with Women Techmakers to launch a series of global events geared towards increasing visibility, community, and resources for technical women in our industry. Who needs an introduction to the social network giant? Facebook is a social networking website where users can post comments, share photographs and post links to news or other interesting content on the web, chat live, and watch short-form video. You can even order food on Facebook if that's what you want to do. Make School is a revolutionary new college in San Francisco. They are the ones redesigning the higher school education through real world projects. No doubt they wanted to sponsor a event which brings out innovative ideas from students. Flatiron Health’s mission is to improve lives by learning from the experience of every cancer patient. Having a noble cause as their mission, they contributed to bring out fresh talents. A hackathon is best described as an 'invention marathon'. Anyone of any skill level is welcome to come and invent anything. If you want to build an iOS game, an IOT sticker vending machine, or even the next big social network, come to HackUTA! Whatever your heart desires! A website, an app, a video game with super VR features, a robot that gives people high fives, the list goes on. Your project will be judged based off its creativity, innovation, coolness factor and technical skills involved. Do not cheapen the HackUTA experience by submitting any previous work or class assignments. Doing so will disqualify your team from final judging and awards. 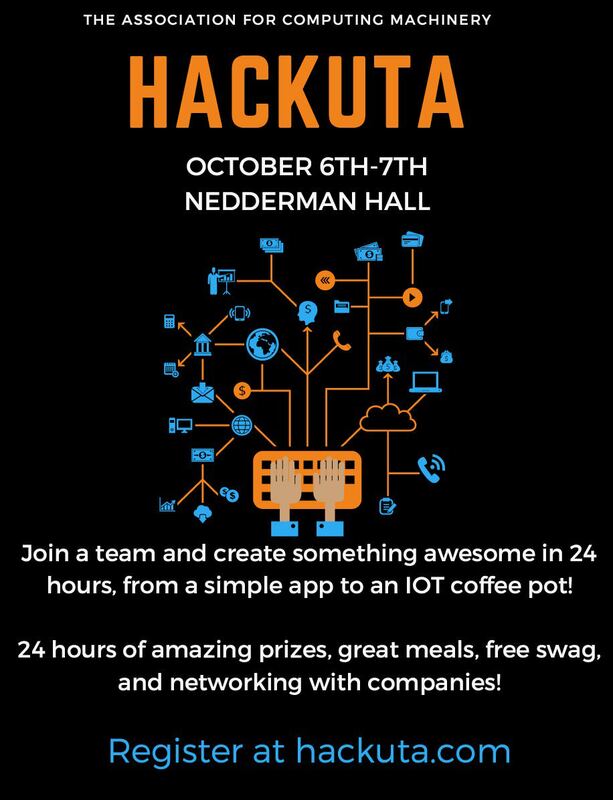 Any college student is eligible for HackUTA. Any experience, any background, any education, any text editor, you're welcome to attend! Yes, teams can be up to 4 people. If you don't have a team yet, we'll help you find one! You can do it alone, but it's not as fun. That is 100% okay! We will have several workshops, mentors and even skilled students to help you out! We just want you to have fun and build something cool. Bring a valid student ID, yourself and anything to contribute to your hack. This includes a laptop, charger, mouse, keyboard, and your five 27" monitors if you wanna be THAT kid. Email them at hackuta.team@gmail.com, and we will reply as soon as we can! Register a domain using Domain.com with code MLH2018. Each team may submit one entry per person on the team. Each winning team member will receive a Raspberry Pi & PiHut Essential Kit. Use any Google Cloud Platform product or service in your hack. Each winning team member will receive a Google Home Mini, max 4 per team. Use Snap Kit in your hack. One winning team will be selected worldwide each weekend and top entries will be reviewed by Snap engineers. Each team member will receive Spectacles by Snapchat. Demo a project that makes the world a better place. One winning team will be selected worldwide each weekend. Each team member will receive a $50 gift card. Use Clarifai's image or video recognition API or SDK in your project. One winning team will be selected worldwide each weekend. Each team member will receive a Clarifai backpack. Results will be made available soon.